Summer came to Vancouver Island this weekend. It won't likely stay for long, but retreat to other regions, then visit again later. But how we're enjoying this little taste of things to come. I've been gardening like crazy - pulling weeds, planting out vegetable starters and replacing a few shrubs. We've barbecued, sat on the lawn, and played ball with Little Miss A. On Friday evening Tim and I went for a walk on the breakwater which protects the entrance to Victoria's Inner Harbour. The breakwater has been closed for a few months while workers installed handrails. They do add to making the walkway more secure and more accessible to families, but the rails take away a little bit of the adventure. I think the rails look like something from the deck of a ship and if they have to be there, are quite attractive. The giveaway winner is Alisa from Life is a Beautiful Place to be. Congratulations. Thank you to all who read my blog and entered the giveaway. I'll be mailing out the parcel this week. I'm linking up a bit late to Mary's Mosaic Monday. It's been too beautiful a weekend to sit at my computer. 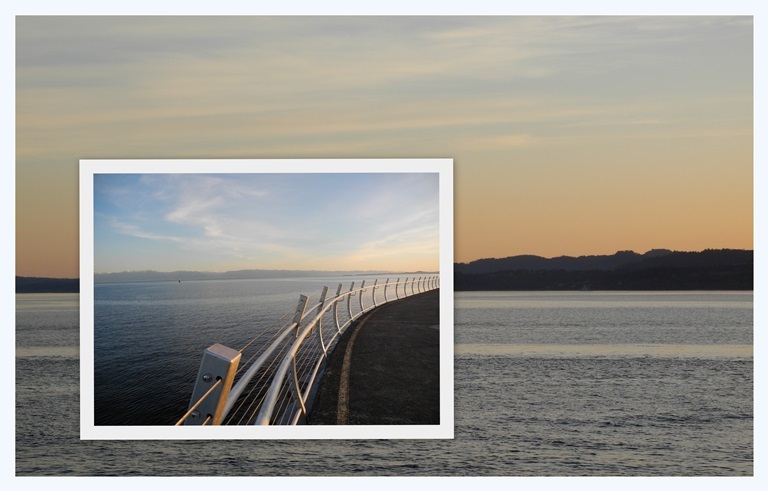 Hi Lorrie - I'm glad to see the handrails are up along the breakwater. It didn't worry me to walk along as a teenager but the last few times I've had the opportunity to walk along I was a little nervous. Glad to hear you are enjoying this wonderful weather! I haven't seen the new look of the breakwater - perhaps this week. It was such a glorious weekend out here, wasn't it? Love these views. It's Summer here in Toronto. So nice to hear of your beautiful (and productive!) weekend! I must say that I would appreciate the handrails. I am the least adventurous person I know. Wasn't our weekend grand? We enjoyed every minute of it - taking long rides - eating on the deck - doing some gardening - greeting neighbors as they walked past - oh it was glorious. Love your photos - it does look like a boat railing. Wasn't that just a glorious weekend? It sounds like you made the most of it too. What a beautiful photo to remember the beauty of the weekend. I love how your eye arranged the mosaic. Pefect and speaks serenity. I love how we all rush out to make the most of the good weather, here on the Coast. We know not to take it for granted, and we savour every minute in our gardens, hammocks, walks -- and the walk you've photographed is so beautiful! Ah spring on the Island...yet it is fleeting isn't it? How pretty! I do like the looks of that handrail. And I missed a giveaway? Darn it! Congrats to the lucky winner. Congrats. to Alisa - lucky gal!!! I love picturing you sitting on the lawn and playing ball with Little Miss A. Glad you are having lovely weather - we've been wet and wild for a few days - we even had a pond form in the back grade from the heavy rain!! Oh my gosh!!! I've been out of town and am just getting over here!